On September 7-8, 2006, a delegation of MCW partners, private developers, business owners, and representatives from the public sector traveled from Minneapolis to Portland for a firsthand look at that city’s widely-admired streetcar system. They discovered that Portland has great passion for its streetcar line and takes justifiable pride in the pattern of urban development it has created. High quality development along the streetcar line is contributing to Portland’s well-deserved reputation for beauty and livability. When Portland first began its streetcar discussions in the early 1990s, conditions in its downtown were dismal. The Portland State University campus was in crisis and evaluating options for alternative locations. Good Samaritan Hospital was in conflict with local neighborhoods over its pressing need to expand its facility and its parking capacity. Downtown’s 23rd Avenue, a commercial corridor somewhat akin to Lake Street, was the site of its own parking conflicts between the bars and restaurants and surrounding neighborhoods. The streetcar line—which now connects all of these places--was a catalyst for tremendous change along its entire route. Five years after opening the initial track in 2001, the City has seen more than $2 billion in high-density, high-quality development along the alignment, generating an estimated $10 million in property taxes per year and saving the region an estimated $1.5 billion in freeway construction costs. The Portland Streetcar line now winds its way through the Portland State University Campus and its pedestrian plaza, with few street barriers and with sidewalk cafes right up to the line’s edge. Since the streetcar opened, PSU has constructed three new buildings on its campus without having to provide any additional parking Despite the narrow two-lane street along the 23rd Avenue commercial corridor, there have been only 5 or 6 accidents since the streetcar line was built. Business is brisk and parking headaches have eased. The view of Portland's Pearl District from the top of the Ecotrust Building. Six years ago, only two of the District’s buildings existed. Lingering concerns about the streetcar from the city’s business community have disappeared. To minimize impact on businesses, the streetcar’s builders committed to a schedule of three weeks' disruption on the street and also developed an active information campaign to keep all business owners well informed. Even auto-dependent businesses have climbed aboard the streetcar. Tire distributor Les Schwab was initially concerned that the streetcar would cause access and parking problems for customers at its downtown Portland retail center. Now, the company hands out streetcar day passes at that location, which is one of its highest-volume stores. According to one of the tour’s speakers, the owner of Oregon landmark bookstore, Powell’s Books, was also wary of the streetcar proposal because it called for tracks on two sides of his store. Now, however, he is an enthusiastic supporter. Even the owners of several major downtown Portland parking ramps support the streetcar line because they see its long-term value in building commerce in the city. The Minneapolis group began its tour at Portland’s Ecotrust Building, which is the first LEED Gold Certified historic renovation project in the United States. Visible from its rooftop is the entire 40-block area of the Pearl District. Once an abandoned railroad yard and brownsite, the District is now 75% built with more than 4,000 housing units, primarily condominiums. Portland's version of a utility pole. Streetcar tracks and bicyclists travel byPowell’s Books. 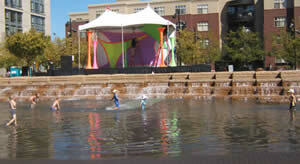 Throughout the Pearl District (and indeed the rest of Portland), the group was struck by the quality of the built environment and the prevalence of public art. The new condo developments are thoughtfully designed and integrated, but without a hint of cookie-cutter homogeneity. Throughout the city, public art fuses with function, such as in the sculptural totems cloaking the poles that support the streetcar’s overhead wires and the rain gardens that fill the new public parks. Beyond its enlightened design features and functional beauty, perhaps the most striking aspect of the Pearl District is its density. The District achieves a 95% FAR (“floor area ratio”), which means that it is built almost to the maximum allowable density. 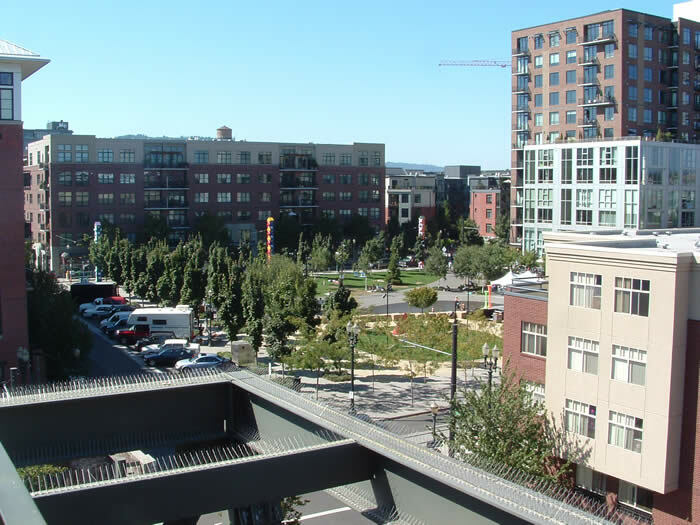 John Carroll, a local developer and one of the tour’s speakers, pointed out that the Pearl District fits as much housing in a single block as a sprawling suburban development might contain in 85 acres. Far from generating local controversy, this density exists because the neighborhood asked for it. The community appears to have embraced an essential truth of urban planning, that appropriate density is a natural and necessary companion to truly sustainable, people-oriented development. 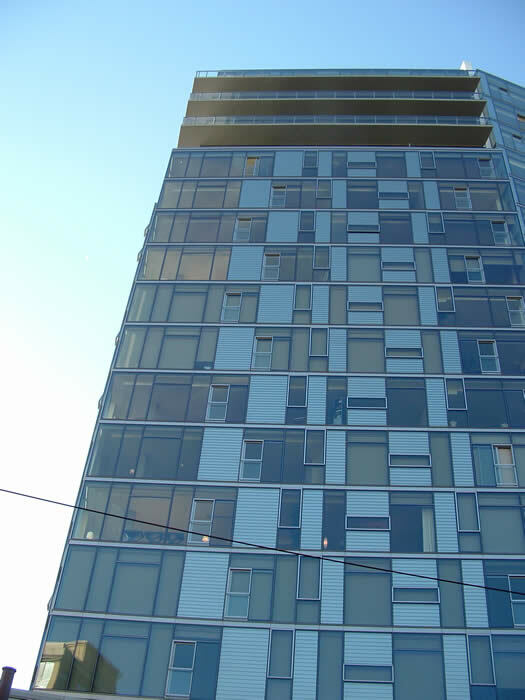 The City actually raised height restrictions for the Pearl District after development began, when neighborhood activists asked for new standards that would permit projects with heights up to 225 feet. The streetcar operates easily through mixed traffic. Rain gardens at a park in the Pearl District. Although many developers initially viewed streetcar simply as an amenity, careful analysis has revealed that it actually dictated the form, intensity, and ultimate success of development along the alignment. Even as density has increased, for instance, developers have built to well below the city’s parking maximum restrictions, because the people occupying this housing simply don’t want parking space for cars that they don’t need to own. The Pearl District (which includes 25% affordable housing, and is 85% owner-occupied) has $1 million condo units with only one parking space per unit. And while the primary market is empty-nesters and young working professionals, the number of families is on the rise. The original plans didn't anticipated it, but young couples have settled into the Pearl District, started families, and stayed put. In fact, the school district now regrets having declined an early offer to reserve a block in the neighborhood for a future school. The Minneapolis tour group was struck by how nimbly Portland’s streetcars run through mixed traffic of cars, pedestrians, and bicycles. The low-profile track integrates seamlessly with streets and passes easily through pedestrian plazas and alongside curbside amenities, essentially disappearing when the streetcar is not present. Portland Streetcar’s maintenance facility occupies three acres underneath a freeway overpass adjacent to the line. The first floor of the shop is 8,000 square feet, with a 5,000 square foot mezzanine. Much of the maintenance activities are performed from above the car, as most of the equipment is located at around the top of the streetcar. There is also a pit for working on the streetcar from below. Tour participants in the streetcar maintenance pit. Sometimes known as the “most European” of American cities, Portland has a transit system to back up that claim, and is in the midst of building entire neighborhoods that can support sustainable, pedestrian-oriented lifestyles on a large scale. To a person, the Minneapolis contingent came away inspired by Portland’s example and convinced that, while it may vary in the particulars, similar transit-oriented success is decidedly within reach for our hometown.